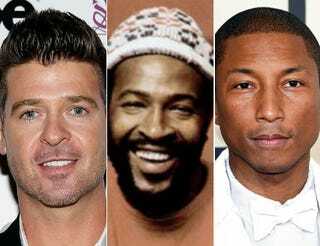 Robin Thicke and Pharrell Williams were ordered Tuesday to cough up nearly $7.4 million to Marvin Gaye's children after a judge found that the duo copied Marvin Gaye's music to create their 2013 hit single "Blurred Lines," the Associated Press reports. "Right now I feel free," said Nona Gaye, Martin Gaye's daughter. According to AP, she wept as the verdict was being read. Gaye went on to describe how she felt free from "Pharrell Williams and Robin Thicke's chains and what they tried to keep on us and the lies that were told," she explained. An attorney for Thicke and Williams previously said that the ruling in this case would reverberate throughout the music industry because it would influence how musicians go about sampling and emulating another artist's sounds. Williams told jurors that while he listened to Gaye's music extensively as a child, he maintained that he didn't use any of Gaye's music to create "Blurred Lines." In addition to Nona, two of Marvin Gaye's other children—Frankie and Marvin Gaye III—all sued Thicke and Williams in 2013. All were present when the verdict was read. Thicke and Williams were nominated for a Grammy for "Blurred Lines," and it was revealed during the trial that each earned more than $5 million from the song's profits.